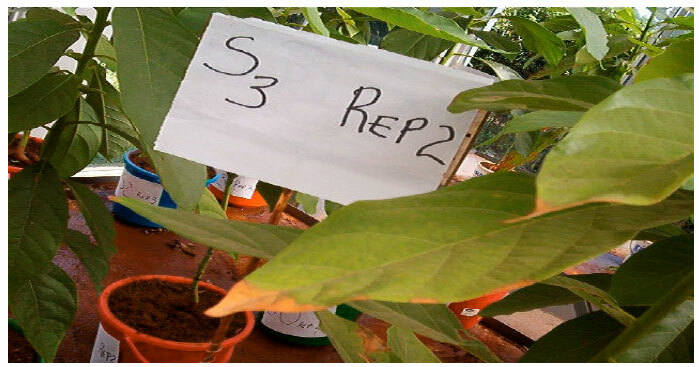 A study was conducted to evaluate the effect of different salinity levels on the growth, gas exchange, soil respiration and nutrient uptake of 8-month-old-avocado seedlings (var. Puebla) grown under naturally illuminated greenhouse conditions. Plants grown in 4.5 L plastic pots containing soil were subjected to 0 (control), 15, 30, 45 and 60 mM NaCl salinity treatments for eight weeks. The analysis of growth parameters such as stem diameter, leaf number, shoot height, root and shoot dry matter content showed that they were significantly affected by salinity of the growth media at (p<=0.05) at the end of the experiment. Net photosynthetic rate (PN), stomatal conductance (gs), transpiration rate (E), leaf water content and chlorophyll (chl) concentration decreased in response to increasing salt concentration in the growth medium. Intercellular CO2 concentration (Ci) and chloride ions content increased with increasing salt concentration of the growth medium. On the other hand, the uptake of other elements was inhibited by the increasing water salinity. Soil respiration of the rooting medium decreased with increasing salt concentration and this caused a decrease in shoot and root total biomass The high intercellular CO2 concentration observed at the higher salinity levels of 45 and 60 mM NaCl in comparison to control plants may indicate a greater inhibition of CO2 fixation or impairment of the photosynthetic apparatus by the sodium chloride toxicity, while the reduced soil respiration may imply low microbial activity and reduced root respiration in the soil rhizosphere caused by salt toxicity. The results obtained demonstrated that low salinity levels such as 45 and 60 mM NaCl highly inhibited avocado seedling growth, nutrients uptake and gas exchange capacity, under the set experimental conditions and that decline in stomatal conductance is accompanied by inhibition of PN due to salt stress. The results also suggest that soils which are saline or irrigating avocado plants with saline water may inhibit nutrient uptake, photosynthesis and hence retarded growth of the avocado seedlings. A heavy environmental concentration of salts unleashes various types of physical and chemical stress in plants, provoking complex responses that involve changes in morphology, physiology and metabolism (Hasegawa et al., 2000; Musyimi, 2005). Growth inhibition by salt stress is associated with alterations in the water relationships within the plant, due to osmotic effects with, specific ion toxicity and mineral deficiencies (Bar et al., 1996; Netondo et al., 2004a; Musyimi, 2005). A number of studies have demonstrated that salinity reduces the uptake of nutrients, accumulations or even affecting the nutrient partitioning within the plants or may be caused by physiological inactivation of a given nutrient resulting in an increase in the plants internal requirements for the that essential element (Grattan and Grieve, 1994). Growth and reproduction can be altered in different ways in the same plant as the shoot is usually more salt sensitive than the root (Weimberg et al., 1984) Reduction in photosynthesis is directly related to stomatal conductance, though non-stomatal factors are also associated with lower photosynthetic capacity of plants growing in saline environments (Farquhar and Sharkey, 1982; Robinson, 1985; Ashraf et al., 2002; Netondo et al., 2004b). Plants vary not only in the rate at which they absorb an available nutrient element, but also in the manner by which they partition the element spatially within the plant. The more vigorous the plant growth under non-saline conditions, the greater is its resistance to salt (Flowers et al., 1988). Plants that tolerate salinity can be grouped into ion-exclusive and ion-inclusive plants (Kramer, 1984). Ion exclusive plants have diverse adaptive mechanisms to restrict salt from reaching the aerial parts except in very small quantities. The mechanisms include the efficient uptake selectively by the roots with respect to certain ions, accumulation of Cl¯ and Na+ in the roots and exclusion of ions from entering the roots from the exterior (Munns and Termaat, 1986; Munns, 2002). On the other hand, inclusive plants take up salt in great quantities and store it in the stems and leaves. The interactive nature affecting nutrient availability, uptake and distribution are real and complex mechanisms in the presence of numerous environmental factors such as aeration, temperature and other stresses such as salinity and flooding (Marchner, 1995; Bar et al., 1996). Soil respiration is a valuable indicator of the decomposing activities in the soil (Walter, 1975). The accumulation of CO2 in the soils depends on the biological activity, diffusivity of the gas, soil moisture and soil temperature. With decreasing volume of soil pores. The CO2 content increases (Walter, 1975). Carbon dioxide originates from respiration of plant roots or from microbial activity during organic matter decomposition. The CO2 dissolves in the soil solution to form bicarbonate and accumulates until it slowly diffuses out of solution into the gas-filled spaces in the soil pores. Salinity and low soil temperature play a great role in limitation to nutrient and water uptake and bring about a serious fall in root conductance (McWilliam et al., 1982) and an extrusion of endogenous solutes triggered by degraded membrane integrity. Avocado (Persea americana Mill.) is a salt sensitive tree crop (Hofshi, 1998; Mickelbart and Arpaia, 2002) and is often grown in areas of relatively low rainfall and saline soils (Branson and Gustafson, 1972). Growth rates of avocado trees on avocado rootstocks have been shown to reduce during an active growth flush under salinity stress (Mickelbart and Arpaia, 2002). Ealier research by Mickelbart and Arpaia (2002) has indicated that sensitivity to salinity among avocado cultivars is reflected in different growth reductions and leaf necrosis. The relative sensitivity to salinity and shallow roots allow for small storage capacity for water and salt in the root zone (Maas, 1990). These capacities are affected strongly by the interactions between the patterns of the water distribution, the irrigation and leaching management and root growth. The salinity profiles depend on the volume ratios of the irrigation pulses to the root zone storage and the fraction of deep seepage of water and salts. Reduced irrigation pulses, with the increase in irrigation frequency, accelerate the buildup of salinity and cause faster increase of salinity with depth (Bernstein and Francois, 1973; Meiri, 1994). It is recognized that leaf age, position on twig, fruiting performance, cultivar, soil type, cultural and management practices such as irrigation and application of fertilizers may all contribute to variations in the mineral concentration of leaves. There is little information available on the possible interaction between salinity, nutrient uptake, plant growth and gas exchange parameters of avocado rootstocks in Kenya. The current interest in utilization of saline problematic soils in arid and semi-arid areas of Kenya requires the understanding of the physiology of avocado tolerance to salt stress, nutrient uptake and behavior of gas exchange characteristics for this fruit tree under salt stress, which is a suitable crop for incorporation into agroforestry systems, to improve food security in rural areas. We subjected eight-month-old avocado seedlings (Persea americana Mill.) to a long term salt stress during the phase of rapid growth and observed the effects of interactions of salt stress on growth, gas exchange, water and nutrient uptake, substrate soil respiration and soil pH. Plant material and growth conditions: Avocado seeds were germinated and raised in a nursery in September, 2003. From the onset of the month of January 2004, the eight-month-old avocado plants (Persea americana Mill.) were transplanted in 4.5 L plastic pots filled with local soil (Fig. 1) classified as kandiudalfic Eutrodox (USDA, 1992). The soil is considered to be moderately P fixing with a soil P concentration corresponding to 310 mg P kg-1 adsorbed by the soil (Nziguheba et al., 1998). The initial soil physical and chemical characteristics at 0-15 cm were pH 5.6 (in a 1:2.5 soil/water suspension); organic carbon (g kg-1 soil) 15.5; extractable soil inorganic P (mg kg-1) 1.3; exchangeable calcium (cmolc kg-1) 4.03; Mg (cmolc kg-1) 1.70; K (cmolc kg-1) 0.3 (by extraction with 0.5 M NaHCO3 +0.01 M Ethylene diaminetetraacetic acid, pH 8.5) and exchangeable acidity (cmolc kg-1) 0.5 (by 1 M KCl extraction); clay 41%; sand 33%; silt 26%; bulk density 1.3 g cm-3 and porosity ranging between 50-60%. The seedlings were raised inside a naturally illuminated greenhouse, whose conditions during the experiment were: temperature: min/max 20/41°C, relative humidity: min/max. 50/95%. The CO2 concentration in the greenhouse was not controlled. The plants were selected on the basis of uniformity of size. The mineral fertilizer used was 20 g of Di-Ammonium Phosphate (DAP) per pot at planting. 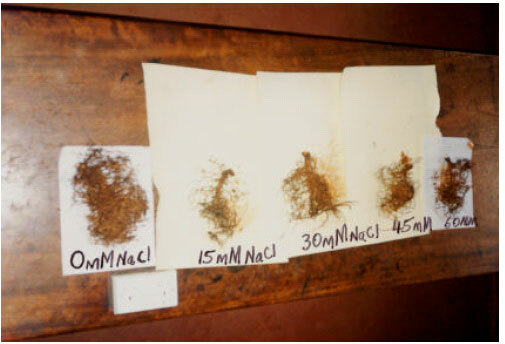 Plants were separated into five lots of 4 plants each; with one lot as control, (0 mM NaCl) and subjecting the other four to different salinity treatments of 15, 30, 45 and 60 mM NaCl. The saline treatments were administered in a step-wise fashion, adding daily increments of 300 mL of 15 mM saline water until the desired concentration was reached. The application rate of saline water was adequate to ensure more than 30% drainage of applied solution through perforations at the bottom of the pots. The pots were arranged in a completely randomized design on a bench. Weeds were uprooted from the pots. Plant growth measurements: The data for growth parameters were recorded once every week before and after the commencement of the salinity treatments. Shoot height was measured using a meter rule, from the stem base up to the shoot apex. The number of fully expanded mature leaves per plant on the main stem and branches were counted and recorded. The change in growth of the stem diameter was determined in each plant by measuring the diameter at a height of 10 cm from the stem base using a vernier caliper. All the above measurements were done once every week. At the end of the experiment the plants were harvested by immersing the pots containing the plants into a bucket full of water to loosen the soil that adhered to the roots. Carefully the soil was isolated from the roots and root and shoot regions were separated. Roots were rinsed in tap water after soaking, then were blotted dry on paper towels and weighed using an electronic weighing balance (Denver Instrument Model XL-3100D). Fresh weight reading for the shoot was taken immediately after harvesting. All the plant samples were then oven-dried at 60°C to constant dry weights, for at least 48 hours, after which time their dry weights were determined. Photographs showing the root mass differences were also taken (Fig. 2 and 3). Leaf water content: Water content of individual leaves of the main axis occupying 8th position from the shoot apex was determined according to the equation of Sibole et al. (2003). LS = [FW-DW/DW]; where FW refers to the fresh weight and DW is dry weight. Percentage leaf water content of the control treatment was calculated for presentation. Substrate soil respiration and soil pH measurements: Soil respiration measurements of the CO2 efflux in g CO2 m-2 h-1 from the pots containing avocado plants, were made with a portable infrared gas analyzer (PP System EGM2 Soil Respiration system with SRC-1 chamber) by circulating air through the sealed soil column inside the pots, after removing the plant shoot at the end of the experiment (40 days after initiating salt treatments). Four measurements were taken from each pot. Soil pH was measured by use of a pH meter (KentE1L 7020) by preparing soil solution extracts from the avocado rhizosphere soil. Gas exchange measurements: An open infrared gas analyzer system in which the CO2 concentration of in- and outcoming air was measured differentially (CIRAS-1, PP Systems, Stotfield, Hitchin, Herts, UK) was used to measure gas exchange parameters (PN, gs, E and Ci), from an area of 2.5 cm2 of the newly expanded leader sun-exposed leaf (from the shoot apex) of the plant in each treatment between 0900 and 1230 h. Photosynthetic rates were measured at 26 to 36°C. The Photosynthetically Active Radiation (PAR) measured at the leaf surface was 120-400 μmol m-2s-1. The vapour pressure deficit within the leaf cuvette was maintained throughout these experiments, at 0.5-0.7 kpa using this system. The air flow rate through the cuvette was 200 mL min-1. Ten consecutive measurements were taken at 3 sec intervals. Measurements were made inside the glasshouse and commenced on the seventh day after initiation of salt treatment and were done once per week. Chlorophyll concentration determination: At the end of the experiment, leaf disk samples from five plants in each of four replications were collected for chlorophyll extraction. Samples were incubated in vials containing 10 mL of absolute methanol. Vials were continuously shaken in a covered water bath at ambient temperature to facilitate chlorophyll extraction. Absorbance was read on a spectrophotometer (Model Novaspec II, Pharmacia Biotech, Cambridge, England) at 650 and 665 nm and chlorophyll concentration calculated (25.5 [A650] + 4.0 [A665]) as mg chlorophyll/g fresh weight (Crafts-Brandner et al., 1984). Foliar nutrient composition: Fully expanded avocado leaves (4 per plant) were washed dried in a forced-air oven at 60°C for 3 days. 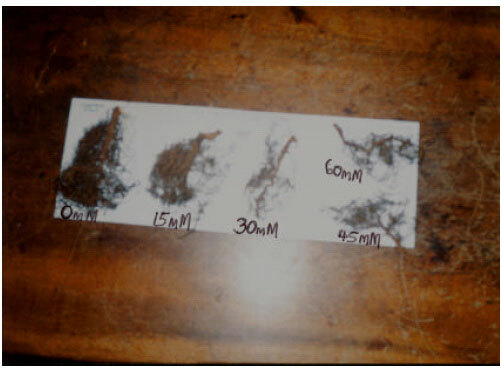 Foliar analysis of N and P was performed on four air dried samples by acid digestion using the Kjedahl method (Okalebo et al., 2002). Complete oxidation by the Kjedahl method followed by spectrometry analysis, was used for K, Mg and Ca. Sodium was determined by dry ashing, followed by atomic emission analysis. Chloride content was determined from an aqueous extract by titrating with silver nitrate (Sibole et al., 2003), by which 0. 1 g of finely ground oven dried leaf tissues were digested over night with 25 cm3 of 0.1 M HNO3 at room temperature according to Sibole et al. (2003). Ion concentrations were calculated on a tissue basis from the dry masses of the same leaf. 25 cm3 of the aqueous extract was used to titrate with 0.1 M Ag NO3. Statistical analysis: Data were subjected to two-way analysis of variance (ANOVA) by SAS statistical package version 8.2 (SAS Institute, 2001). Variables were tested for normality and homogeneity of variances and transformations made as necessary to meet the underlying statistical assumptions of ANOVA. Differences between treatments were considered significant at p≤0.05. Plant growth, leaf water content and chlorophyll content: Plant growth was lower in salinised plants than in control plants, i.e., 47.4% of control plant values; however, there were no significant (p≤0.05) differences in shoot height growth between salinity treatments (Table 1). Salinity significantly increased stem diameter in 15 mM treatment, in the first few days after initiation of salt treatments (Data not presented). Generally, salt treated seedlings had significantly (p≤0.05) smaller stem diameter than control plants (Table 1). For example, stem diameter growth inhibition was 71.8% of control plants values at 60 mM NaCl. Overall, salinity reduced the final numbers of leaves per plant, from 100 to 22.5% at 60 mM NaCl treatment and prolonged the duration of development of new leaves over the study period (Data not presented). Growth at high salinity resulted in large reductions in dry matter production of both shoot and root, i.e., 37.5 and 19.1%, respectively at 60 mM NaCl (Table 1). The pattern of reduction in root dry matter production (Fig. 2 and 3) may be related to few number of leaves per plant, low net photosynthetic rate and low nutrient uptake as salinity level of the growth media increased. Leaf water content increased with increasing salt concentration and then decreased at 60 mM, i.e., 80, 100 and 103% percentage values of control plants (from 15, 30 and 45 mM, respectively). The 45 mM NaCl stressed plants had much higher leaf water content values than the other salt treated plants (Table 1). It appears that salt is taken up by the plant with an accompanying water absorption due to increasing negative osmotic potential. This can be an osmotic adjustment to salinity. Gas exchange: Net photosynthetic rate (PN) of salinised plants was 52.9 to 66.2% of the control plants after 8 weeks. Salinity treatment had significant effect on PN (p≤0.05) At 60 mM NaCl; the plants were slightly more affected than at all other salinity levels. Generally, salinised plants had significantly (p≤0.05) lower stomatal conductance in contrast to control plants (Table 2). The gs values ranged from about 56.5 to 87.0% of values from control plants. As expected salt stress decreased the amount of water lost by the plant. Transpiration rate (E) decreased significantly (p≤0.05) in response to increasing salt concentration of the growth medium (Table 2). From 15 to 60 mM NaCl, the decreases in E were 98.1, 88.6, 85.0 and 78.0% of control plants, respectively. Salinity stress of the growth medium caused significant (p≤0.05) increase in Ci. The increases in Ci were 224, 269, 335 and 422% of control plants values, from 15 to 60 mM NaCl, respectively measured after 8 weeks of salt application. Substrate-induced soil respiration and soil pH: Measurement of soil respiration at the end of the experiment showed that there were significant (p≤0.05) differences between treatments (Table 2). The values expressed as percentages of control treatment were 87.9, 74.1, 55.2 and 37.9% from 15 to 60 mM NaCl, respectively. At the end of the experiment there were differences in soil pH values between treatments (Table 2). All the treatments showed a steady increase in soil pH. Leaf chlorophyll content: Compared to the control plants, chlorophyll content was severely reduced by 60 mM NaCl treatments, about 53.9% of control plants (Table 3). The differences between control and salt treatments were significant at p≤0.05). Chlorophyll a content was higher in the leaf than Chl b, i.e., 53.9 and 46.5%, respectively. Foliar nutrient ion content: The results of foliar analysis of the major elements (N, P, K and Mg) and leaf chloride are shown in (Table 4), against salinity levels of the growth medium. By contrast, control treatment had the highest foliar N, P, K, Ca and Mg contents and low Na contents. Total chloride content of leaves increased significantly (p≤0.05) with external salinity in the growth medium (Table 4). Tip burn symptoms due to chloride (Mickelbart and Arpaia, 2002) were visible on mature leaves of avocado plants (Fig. 4). Leaf injury, leaf and stem chlorosis and occasionally necrosis and stem collapse were evident during the study. Salt stressed plants had generally lower shoot, root and stem diameter growth (Table 1). A reduction in growth caused by increasing salinity is a well known phenomenon, but the growth of some plants may be stimulated by sodium chloride (Soussi et al., 1998). There was a short term stimulation of net photosynthetic rate (PN) and growth during the first days of saline water irrigation (Data not presented), except for 60 mM treatment. This stimulation was also evident in the results for stem diameter growth (Table 1). The stimulation could be linked to improved water use efficiency through reduced water loss through reduction in transpiration rate (E) and increased leaf water retention (Table 1). Generally an increase in shoot height and stem diameter growth occurred during the study, but it was not detected at 45 and 60 mM NaCl. This observation may suggest an increased cell growth and cell number due to osmotic adjustment. This may be due to vessel size modifications contributing to regulate plant growth at relatively lower salt stress (Cramer et al., 1994). Inhibition of shoot growth after weeks to months of salinization has been attributed to excessive salt accumulation in leaves, resulting in a water deficit in the symplast and to toxic ionic effects (Rengel, 1992). Salinity stress reduced root growth (Fig. 2 and 3). Osmotic adjustment has been defined as the lowering of osmotic potential due to net solute accumulation (Girma and Krieg, 1992). Moderate salt stress can increase extension as a result of osmotic adjustment process which maintains root growth during periods of salt stress (Reinhardt and Rost, 1995). Modifications of plant organ size such as increased stem diameter growth are likely to be common mechanisms of response to salinity in avocado and may help in reducing water loss from the plant and avoiding embolisms, which would impair functioning of the whole plant growth. The decrease in growth is related to the chloride content of the leaves (Shortle et al., 1972). Small containers of rooting media may restrict plant growth (e.g., Ouma, 2005, unpublished observations). However, we did not identify any root restriction at the time of harvest (Fig. 2 and 3), indicating that the reductions observed in shoot and root growth were from salt stress and not the pot size. Long term reduction in biomass accumulation in salt stressed avocado plants was a result of reduced number of leaves and foliage area as a consequence of increased leaf death and defoliation (Table 1). Increased leaf death and defoliation was observed during the study and may account for the very few numbers of leaves observed in salt treated plants than in control plants. Some researchers have observed limited carbon supply due to increased incidence of necrotic margins on the leaves and defoliation of salt stressed plants (Oster and Arpaia, 1992; Cramer et al., 1994; Mickelbart and Arpaia, 2002). Salinity reduced net photosynthetic rate. Stomatal closure can lead to low PN and E and gs (Belkhodja et al., 1999). Drake et al. (1997) have shown that decreases in stomatal conductance can explain reductions in leaf transpiration rate. Increased leaf water deficits may lead to lower leaf gs, which directly contribute to reduction in PN (Tan and Buttery, 1986). These factors may contribute to xylem conductivity changes in the plant. Decreased stomatal conductance associated with high Ci, is an adaptive response to extracellular CO2, by which diffusional limitations to photosynthesis are adjusted in response to changes in mesophyll demand for CO2. Although both stomatal and nonstomatal factors have been implicated in the reduction of photosynthesis following irrigation with saline water, most of the reduction in photosynthetic rates is the result of nonstomatal effects. Salinity toxicity showed up as interveinal leaf burn, scorch and dead tissues along the outside edges of leaves. Salinity reduces shoot growth by suppressing leaf initiation and expansion as well as internode growth and by accelerating leaf abscission (Ziska et al., 1990). Foliar Cl- concentration caused leaf burn (Fig. 3) which may have contributed to reduction in amount of chlorophyll and leaf surface area for photosynthesis. The results indicate that chloride may have contributed to inhibition of chloroplasts activity or even in the synthesis of chlorophyll or accelerate chlorophyll degradation (Soussi et al., 1998; Ashraf et al., 2002). Decreased leaf chlorophyll content also contributed substantially to the decreased PN. The results indicated that chl a was higher than chl b showing that salinity induced a marked decrease in chl b. The reduction of chl b may suggest structural damage of the photosystem II reaction centres; and would explain the high Ci in salt treated avocado plants (Table 2). Earlier findings by Lutts et al. (1996) have indicated that chl b is associated with PS antenna. Irrigation with water of high salinity could have affected thylakoid membranes by disrupting lipid bilayer or lipid protein associations and hence impairment of electron transport activity (Sharma and Hall, 1992; Netondo et al., 2004b). Irrigation of avocado seedlings with saline water of different salt concentrations contributed to differences in foliar nutrient contents (Table 4). Inhibition of growth and damage from salinity may be attributed to excessive accumulation of Cl¯ and Na+ in the leaves (Shalhevet, 1999), which may have provoked the nutritional imbalance leading to reduction in the uptake of N, P, Ca, Mg and K. Salinity reduced the uptake of N by the plant. This is also supported by other earlier studies on other fruit crops (Bar et al., 1997). This observation is attributed to Cl- antagonism of NO¯3 uptake. Chloride ions may have also contributed to the reduction in P uptake and accumulation into avocado leaves. Some studies have reported similar results with other crops (Sharpley et al., 1992). As the salt concentration in the root zone increases, plant requirement for Ca2+ also increases (Bernstein, 1975). At the same time, the uptake of Ca2+ from the substrate may be depressed by ion interactions and increases in ionic strength. Sodium chloride salinity reduced leaf Mg2+content and the reduction may be attributed to competition by Ca2+ for the same binding sites. Some of the adverse effects of salinity may have been attributed to a K+ deficiency; due to antagonistic action by Na+ (Shalhevet, 1999). The high foliar concentration of Na+ and Cl- may have interfered with photosynthetic rate, stomatal conductance and transpiration rate, (Table 2), indicating that salinity caused a reduction in water loss and photosynthesis per unit leaf area. Salinity induced K+ deficiency and such a deficiency has been implicated in reduction in growth and yield in other crops (Song and Fujiyama, 1996). Low K+ content in the leaves, imply that salinity impairs the uptake of K+ in avocados. Higher K+ contents in the plant tissues are required for shoot growth. 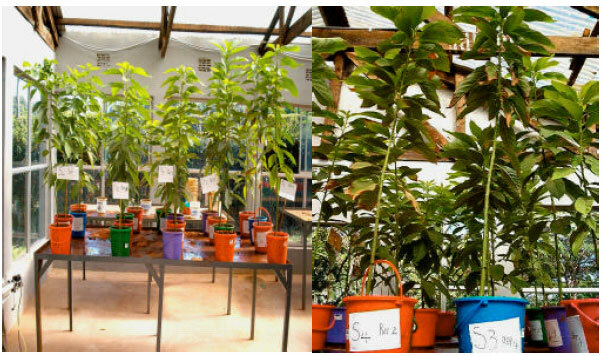 The negative effect of the low foliar nutrient uptake was reflected in the poor growth of shoots and roots of avocado seedlings at higher salinity levels. Salt stressed seedlings took up less water than well watered seedlings and this in turn, could have marked effect on net photosynthetic rate and plant growth. A decrease of the conductivity to water flow along the soil-plant-atmosphere water pathway can reduce water loss to the atmosphere, this can occur through increased resistance to water flow of other segments such as the roots and shoots, which is actually part of response to salt stress. It is important to remember that the amount of water available for uptake by plant is crucial because the rate of water uptake is tightly coupled to the rate of carbon uptake. Even though a reduction in leaf numbers on the branches accounted for most of the salt stressed induced decrease in whole-plant leaf area, decrease in nutrient and water uptake (Table 4), also contributed substantially to the reduction in avocado growth. The concentrations of avocado nutrients can conceivably be influenced by the salinity level of the irrigation water and soil fertility. Soil respiration of the rooting medium decreased with increasing salt concentration, suggesting that using saline water for irrigation can inhibit the root respiration and microbial decomposition activity. Once CO2 is released into soil, it dissolves in the soil solution to form bicarbonate and accumulates until it slowly diffuses out of solution into the gas-filled spaces in the soil pores. High bicarbonate concentrations are especially a problem in poorly drained soils, or in soils that are maintained under high soil salinity. Salinity also increased the soil pH (Table 4), indicating that irrigation with saline water over time will definitely influence the soil characteristics either positively or negatively. The problem of soil pH change may have been aggravated by high bicarbonate content accumulation in the soil by irrigation with high saline water. This study presents evidence showing that high growth inhibition of avocado seedlings occurred at high salinity and may be attributed to high foliar chloride and sodium ion uptake which brought about nutritional element imbalances affecting the normal functioning of the plants. The results show not only that salinity affects the gas exchange parameters and chlorophyll concentration of avocado leaves, but also interferes with the uptake of essential nutrients required for the healthy growth and development of avocado seedlings. In the long term, total photosynthesis is reduced as a result of inhibition of leaf formation and expansion as well as early leaf abscission. Irrigating with saline water also affects the rhizosphere soil pH and soil respiration. In short, there is no doubt that irrigating avocado plants with water of different salinity levels led to differences in the uptake of water and mineral nutrients, consequently giving rise to differences in photosynthesis and growth among the different saline water treatments. The results suggest that this Kenyan avocado rootstock (var. Puebla) is sensitive to substrate salinity of about 30 mM NaCl, hence cannot do well in saline problematic soils. It is therefore recommended that selection and screening of avocado rootstocks be carried out in order to identify avocado rootstocks that can exclude ions and hence strengthen salt resistance through breeding and grafting. We thank the School of graduate studies of Maseno University-Kenya for providing financial support to conduct this research. Ashraf, M., F. Karim and E. Rasul, 2002. Interactive effects of gibberellic acid (GA3) and salt stress on growth, ion accumulation and photosynthetic capacity of two-spring wheat (Triticum aestivum L.) cultivars differing in Salt tolerance. Plant Growth Reg., 36: 49-59. Bar, Y., A. Apelbaum, U. Kafkafi and R. Goren, 1996. Polyamines in chloride-stressed Citrus plants: Alleviation of stress by nitrate supplementation via irrigation water. J. Am. Soc. Hortic. Sci., 121: 507-513. Belkhodja, R., F. Morales, A. Abadia, H. Medrano and J. Abadia, 1999. Effects of salinity on chlorophyll fluorescence and photosynthesis of barley (Hordeum vulgare L.) grown under a triple-line-source sprinkler system in the field. Photosynthetica, 34: 375-387. Bernstein, L. and L.E. Francois, 1973. Leaching requirement studies. Sensitivity of alfalfa to salinity of irrigation and drainage waters. Proc. Soil. Sci. Soc. Am., 37: 931-941. Bernstein, L., 1975. Effects of salinity and sodicity on plant growth. Ann. Rev. Phytopathol., 13: 295-312. Branson, R.L. and C.D. Gustafson, 1972. Irrigation water-a major salt contributor to avocado orchards. California Avocado Soc. Yearbook, 55: 56-60. Crafts-Brandner, S.J., F.E. Below, J.E. Harper and R.H. Hageman, 1984. Effects of pod removal on metabolism and senescence of nodulating and non-nodulating soybean isolines. II. Enzymes and chlorophyll. Plant Physiol., 75: 318-322. Cramer, G.R., G.J. Alberico and C. Schmidt, 1994. Leaf expansion limits dry matter accumulation of salt-stressed maize. Aust. J. Plant Physiol., 21: 663-674. Drake, B.G., M.A. Gonzalez-Meler and S.P. Long, 1997. More efficient plants: A consequence of a rising atmospheric CO2. Annu. Rev. Plant Physiol. Plant Mol. Biol., 48: 609-639. Farquhar, G.D. and T.D. Sharkey, 1982. Stomatal conductance and photosynthesis. Ann. Rev. Plant Physiol., 33: 317-345. Flowers, T.J., F.M. Salama and A.R. Yeo, 1988. Water-use efficiency in rice (Oryza sativa L.) in relation to resistance to salinity. Plant.Cell Environ., 11: 453-459. Girma, F.S. and D.R. Krieg, 1992. Osmotic adjustment. I. Mechanisms of diurnal osmotic potential changes. Plant Physiol., 99: 577-582. Grattan, S.R. and C.M. Grieve, 1999. Mineral Nutrient Acquisition and Response by Plants Grown in Saline Environments. In: Handbook of Plant and Crop Stress, Pessarakli, M. (Ed.). Marcel Dekker, New York, pp: 203-229. Hasegawa, P.M., R.A. Bressan, J.K. Zhu and H.J. Bohnert, 2000. Plant cellular and molecular responses to high salinity. Annu. Rev. Plant Physiol. Plant Mol. Biol., 51: 463-499. Hofshi, R., 1998. Dreaming in reality. California Avocado Soc. Yearbook, 82: 137-154. Kramer, D., 1984. Cytological Aspects of Salt Tolerance in Higher Plants. In: Salinity Tolerance in Plants Strategies for Crop Improvement, Staple, R.C. and G.H. Toeniessen (Eds.). Wiley and Sons, New York, pp: 21-37. Lutts, S., J.M. Kinet and J. Bouharmont, 1996. NaClG induced senescence in leaves of rice (O. sativa L.) cultivars differing in salinity resistance. Ann. Bot., 78: 389-398. Maas, E.V., 1990. Crop Salt Tolerance. In: Agricultural Salinity Assessment and Management, Tanji, K.K. (Ed.). American Society of Civil Engineers, New York, pp: 262-304. Marschner, M., 1995. Mineral Nutrition of Higher Plants. 2nd Edn., Academic Press, London, New York, ISBN-10: 0124735436, pp: 200-255. McWilliam, J.R., P.J. Kramer and R.L. Musser, 1982. Temperature induced water stress in chilling-sensitive plants. Aust. J. Plant Physiol., 9: 343-352. Meiri, A., 1994. Tolerance of different crops to salinity conditions in soils. Proceeding of 15th International Congress of Soil Science, ISSS. Acapulco, Mexico. Mickelbart, M.V. and M.L. Arpaia, 2002. Rootstock influences changes in ion concentration, growth and photosynthesis of Hass avocado trees in response to salinity. J. Am. Soc. Hortic. Sci., 127: 649-655. Munns, R. and A. Termaat, 1986. Whole-plant responses to salinity Aust. J. Plant Physiol., 13: 143-160. Munns, R., 2002. Comparative physiology of salt and water stress. Plant Cell Environ., 25: 239-250. Musyimi, D.M., 2005. Evaluation of young avocado plants (Persea americana Mill.) for tolerance to soil salinity by physiological parameters. M.Sc. Thesis. Maseno University, Kisumu, Kenya. Netondo, G.W., J.C. Onyango and E. Beck, 2004. Sorghum and salinity: I. Response of growth, water relations and ion accumulation to NACl salinity. Crop Sci., 44: 797-805. Netondo, G.W., J.C. Onyango and E. Beck, 2004. Sorghum and salinity: II. Gas exchange and chlorophyll fluorescence of sorghum under salt stress. Crop Sci., 44: 806-811. Nziguheba, G., C.A. Palm, R.J. Buresh and P.C. Smithson, 1998. Soil phosphorus fractions and adsorption as affected by organic and inorganic sources. Plant Soil, 198: 159-168. Okalebo, J.R., K.W. Gathua and P.L. Woomer, 2002. Laboratory Methods of Soil and Plant Analysis a Working Manual. 2nd Edn., TSBF-CIAT and SACRED Africa, Nairobi, Kenya. Oster, J.D. and M.L. Arpaia, 1992. Hass avocado response to salinity as influenced by clonal rootstocks. Lovatt, C.J. (Ed.). Proceedings of the World Avocado Congress, April 21-26, 1992, Orange, CA., pp: 209-214. Reinhardt, D.H. and T.L. Rost, 1995. Primary and lateral root development of dark and light-grown cotton seedlings under salinity stress. Bot. Acta, 108: 403-465. Rengel, Z., 1992. The role of calcium in salt toxicity. Plant Cell Environ., 15: 625-632. Robinson, S.P., 1985. Osmotic adjustment by intact isolated chloroplasts in response to osmotic stress and its effect on photosynthesis and chloroplast volume. Plant Physiol., 79: 996-1002. SAS Institute Inc., 2001. SAS/STAT Software SAS Language Guide for Personal Computers. 8.02 Edn., SAS Institute Inc., Cary, NC. Shalhevet, J., 1999. Salinity and water management in avocado. Proceedings of the Avocado Brainstorming, October 27-28, 1999, Riverside, CA. Hofshi Foundation, pp: 84-91. Sharma, P.K. and D.O. Hall, 1992. Changes in carotenoid composition and photosynthesis in sorghum under high light and salt stresses. J. Plant Physiol., 140: 661-666. Sharpley, A.N., J.J. Meisinger, J.F. Power and D.L. Suarez, 1992. Root extraction of nutrients associated with long-term soil management. Adv. Soil Sci., 19: 151-217. Shortle, W.C., J.B. Kotheimer and A.E. Rich, 1972. Effect of salt injury on shoot growth of sugar maple. Acer saccharum. Plant Dis. Rep., 56: 1004-1007. Sibole, I.V., C. Cabot, C. Poschenrieder and J. Barcelo, 2003. Efficient leaf ion partitioning: An overriding condition for abscisic acid-controlled stomatal and leaf growth responses to NACl salinization in two legumes. J. Exp. Bot., 54: 2111-2119. Song, J.Q. and H. Fujiyama, 1996. Difference in response of rice and tomato subjected to sodium salinization to the addition of calcium. Soil Sci. Plant Nutr., 42: 503-510. Soussi, M., A. Ocana and C. Lluch, 1998. Effects of salt stress on growth, photosynthesis and nitrogen fixation in chick-pea (Cicer arietinum L.). J. Exp. Bot., 49: 1329-1337. Tan, C.S. and B.R. Buttery, 1986. Photosynthesis, stomatal conductance and leaf water potential in response to temperature light in peach seedlings. HortScience, 21: 1180-1182. USDA, 1992. Soil Taxonomy. Agricultural Handbook Inc., Washington, D.C., pp: 294. Walter, L., 1975. Physiological Plant Ecology: Ecophysiology and Stress Physiology of Functional Groups. 4th Edn., Springer-Verlag, Germany. Weimberg, R., H.R. Lerner and A. Poljakoff-Mayber, 1984. Changes in the growth and water-soluble concentration in Sorghum bicolor stressed with sodium and potassium salts. Physiol. Plant., 62: 472-480. Ziska, L.H., L.H. Seeman and T.M. DeJong, 1990. Salinity induced limitations on photosynthesis in Prunus salicina, a deciduous tree species. Plant Physiol., 93: 864-870.